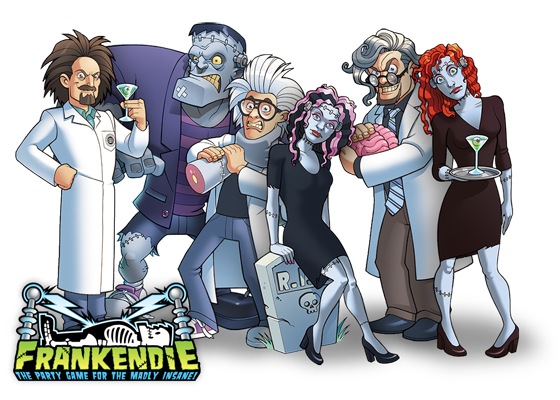 FrankenDie: The Party Game for the Madly Insane! FrankenDie is a game of dice rolling, frantic dashing to the graveyard, body part gathering and racing to reanimate your creature. 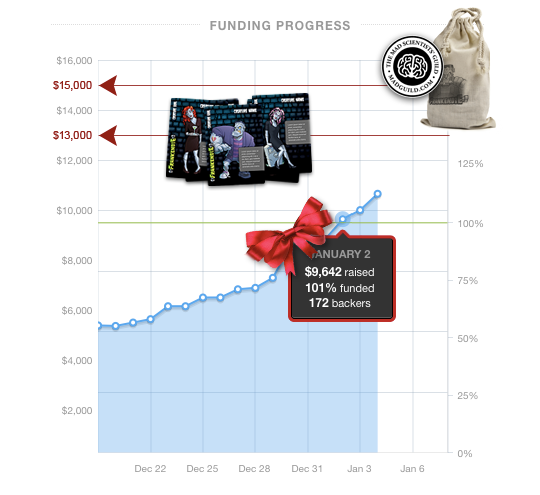 248 backers pledged $13,127 to help bring this project to life. Page updated on January 8, 2012. FrankenDie is Coming to Life! Thanks to the generous support of hundreds of backers, FrankenDie will be available for players all over the world! The process of planning and executing a Kickstarter campaign has been an amazing journey, with moments of excitement, uncertainty, elation, exhaustion, humility, and sincere triumph. Through it all, we've learned a great deal of what it takes to make it in this industry, including a ton of hard work and sleepless nights (literally). We're not done learning, but we are committed to bringing you entertaining, high-quality, and visually stunning games. And we've built an invaluable cache of industry contacts to help keep us on track at every step of the way. It's difficult to explain just how thankful we are, for everyone who has supported, encouraged, coached and counseled us along the way. If you could pile our gratitude up, it would be as high as a stack of every copy of Monopoly ever sold. Thank you all for embarking on this journey with us. We can't wait to see what wondrous places this ship, named NutForge Games, will take us. And if you're just joining, FrankenDie will be available for pre-order at FrankenDie.com. The Party Game for the Madly Insane! FrankenDie is NutForge Games' inaugural project, and we'd love for you to be a part of it. It is a fast-paced, reflex party game for 3 to 6 players. Combining the tactile nature of dice rolling, the excitement of a "first to buzz in" mechanism, and pattern recognition to exercise your brain, we're confident that FrankenDie will bring your party to life! You are a Mad Scientist competing to assemble a Creature from serviceable body parts scavenged from the graveyard. Once your Creature has a "lightly used" head, body, two arms, two legs and the all-important brain, it's time to re-animate it with a charge of lightning and a cry of... "It's Aliiiiiive!" So you've seen the video, but now you thirst for the full set of rules! Satiate that need with our early draft rulebook (work-in-progress). NOTE: The game will include English and French rulebooks. Go Mad! Get illustrated in the game before it's published! Have you ever wanted to be a Mad Scientist, or the adorable Creature of one? Of course you have! Well, this is your lucky day! We're giving 16 daring backers the chance to be immortalized in the game's artwork. 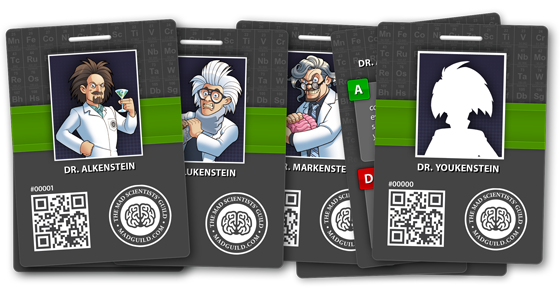 Choose between being caricatured as one of the characters in the Mad Scientists' Guild expansion, or as a Creature to be assembled from various body part tokens. Note: You may add the expansion to any pledge, by adding $5 per copy of the expansion (with no additional shipping charges). As part of our campaign, we'll be offering all backers a chance to pledge the Mad Scientists' Guild expansion, with or without a copy of the game. The Guild consists of 12 character cards, with unique special abilities that will bring an additional, unique element into the game, with an extra serving of theme for added flavor. 3. A 3" iron-on stitched Mad Scientists' Guild patch! Note: Final artwork may not be exactly as illustrated above. We're offering all backers the option to augment their orders with some insane swag, which no mad man or mad woman should be without! An additional $20 or $40 should be added if you have an address outside Canada or the USA (amount is listed in each pledge level description). We have pledge levels that offer multiple copies of the game specifically created to help our international customers share the shipping bill. Thank you for taking the time to read about FrankenDie. We hope you have decided to back this project. Your support, no matter at what level, is always very appreciated. Al Leduc is a proud member of Game Artisans of Canada. Special thanks to all of the playtesters, Game Artisans of Canada for their support, Daryl Chow for photography, and our creature models Amy and Lara. Choose your pledge package below, then you can add any quantity of the following: $5 per Mad Scientists' Guild Expansion --AND/OR-- $15 per T-Shirt --AND/OR-- $35 per Lab Coat --- Shipping costs: USA/CAN is FREE, International (INTL) is listed in each pledge package. GAME SUMMIT VIP: (2) FrankenDie Games + (2) Mad Scientists' Guild Expansions + (2) T-Shirts + (2) Lab Coats. PLUS: You (and a friend) will receive the royal treatment at Game Summit 2012 (gamesummit.ca) in Ottawa Canada (travel & lodging not included). With your VIP passport you (and a friend) can enter any tournaments during the weekend. Hangout with the Game Designer, the Publishers, and all other actors from the video (even the Monster) + access to the VIP lounge + Get a loot bag of fun stuff (Value: $500+). Actual games & expansions will be shipped in June 2012.